Thankfully, Rice Kernel is having tons of fun. And the parents are having even more fun watching these 5- and 6-year olds. So much so, we organized a team practice to get “some” drills and skills in. With cantaloupe “balls” and mini bagel “hoops” on the menu, we were craving something sweet for our early morning breakfast. 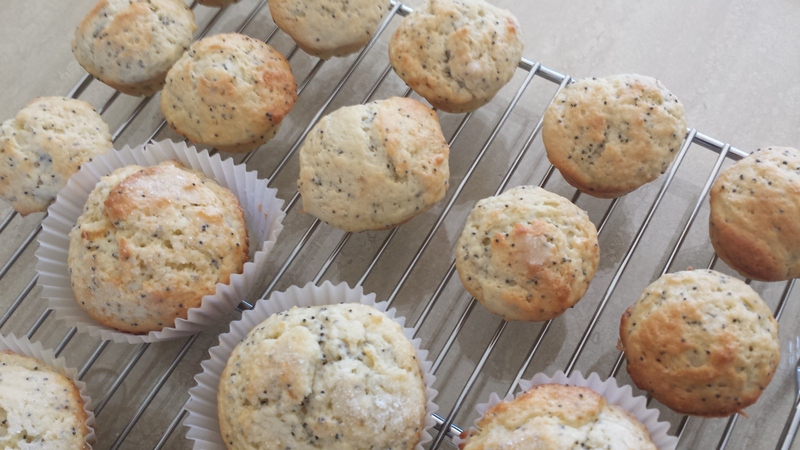 Lemon poppyseed was unanimous. Modified from a Joy the Baker recipe, these are made with thinned Greek yogurt instead of sour cream for a healthy protein boost. You know, after all that running on the court…. Cooked in the slow-cooker, this recipe is substantial and perfect for the nights we come home from a full day of school and activities and are in a rush to bathe, eat, and get the kids ready for bed. Perfectly filling and delicious as is, my family prefers the soup with some sweet potatoes or pasta thrown (precooked or thrown into the slow cooker with 10-15 minutes to go), or some crusty bread on the side. Add chicken to a 6 or 7 quart slow cooker, then add onions, celery and garlic, and olive oil. Add quinoa and thyme and pour in chicken broth. Season with salt and pepper to taste. Cover and cook on HIGH 3 1/2 – 4 hours or LOW 7 – 8 hours. Remove chicken, let rest 10 minutes then cut or shred into bite size pieces and return to soup. Add kale and lemon juice, then cover and continue to cook on HIGH heat another 15-20 minutes. Amazing how half a year has elapsed since our last post. Rice Kernel turned 5, enjoyed a delightful tour of summer camps, went to his first symphony, helped Grandpa dry dock a boat, graduated from his love of all things fire- and police-related, and began full-day kindergarten a week ago. Let’s be honest, he had a few meltdowns and tantrums in between but, all in all, he’s done a great deal of growing – literally and figuratively. Our little Claire started walking and a strong, feisty personality has emerged. It has been trying and funny at the same time. She’s spitting out a few phrases and key words these days and enjoying her share of yummy foods. Quite the eater, my second-born is nothing like her older brother – she doesn’t like vegetables and loves to eat socially. Although we’ve been cooking meals most nights, my time for baking has gone to the wayside. Mostly it’s because I can’t concentrate long enough to keep track of ever-moving Claire. And even if I find a precious 10-15 minute span alone, I’d rather be doing something with Claire. All this has left me with plenty of opportunity to sample store-bought cookie varieties. All of which pale in comparison to the homemade variety, I think. So recently, with a few past-their-prime avocados on the counter, I decided to bake up a batch of my favorite oatmeal cookies with avocado. 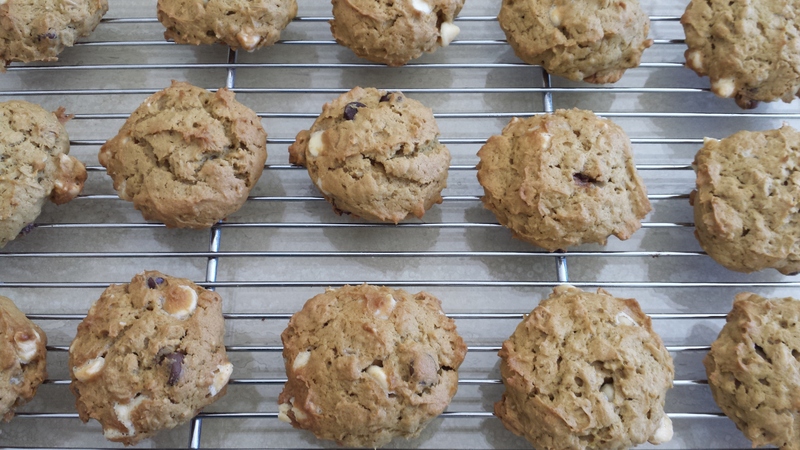 I found the below recipe online – the cookies looked beautiful. Although they are laced with avocado, you will never detect any guacamole taste in here! These cookies are fluffy, crispy on the edges, and full of oaty texture. Speckled with chocolate chips, they are a nice treat for anyone, any day. Cut the avocado in half and scoop out the flesh into a large bowl. Add the butter and brown sugar. Cream together until fluffy. Add the eggs, one at a time, followed by the vanilla. Mix well until well combined. Add the flour, baking soda, salt and baking powder. Mix slowly then add the chocolate chips and oats. Be careful not to overmix here. Place the dough in the fridge to chill for one hour. Preheat the oven to 325 degrees. Line a baking sheet with parchment paper. After the dough has chilled, scoop out spoonfuls of dough on the baking sheet and press down gently with your hand to flatten. Bake for 18 minutes, until golden brown. Repeat with remaining dough. My favorite cake, in cookie form. Half chewy, half crisp, with all sorts of fruity, nutty textures throughout. As much as we enjoy good-for-you foods, there’s always room for something sweet in my day. Does wonders for my spirit – and blood sugar! The easiest, failproof, and decadent frosting. Simple dip your baked goods in the frosting, or drizzle it liberally for a smooth and silky finish. Or, for a different texture whip the frosting until airy. Either way, it is sure to delight. Heat the half-and-half until hot to touch, but not boiling. Pour over chocolates and stir until fully incorporated. Recently, our dear friends Dennis and Patsy came for dinner. Dennis is our closest friend from law school. The first friend we told about Rice Kernel; the only friend who’s ever babysat Rice Kernel! In fact, our little boy was Dennis and Patsy’s ringbearer last summer. Dennis and Patsy are both as kind-hearted, good-humored and generous as friends get. We are thrilled that they are expecting their first child this summer. Dennis and Patsy happen to be great cooks and hosts. They host yearly BBQs, crab bakes, and “pork-a-paloozas,” as Dennis calls them. When it comes to dessert, their tastes are simple – sundaes and cookies. Having endured her share of pregnancy symptoms, I knew Patsy would appreciate these little nuggets of buttery delight for dessert – and to take home. 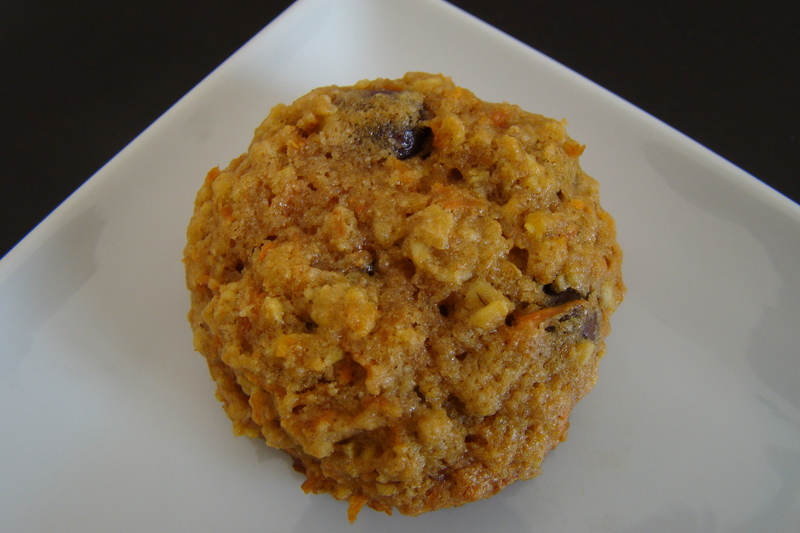 I’ve added pudding mix to cookies before – they provide a chewy, soft texture to the cookies, which we prefer. With a hearty dose of old fashioned oats (you can use quick cook), these boast a crispy, nutty exterior and a soft, buttery, chocolately middle. They are perfect. 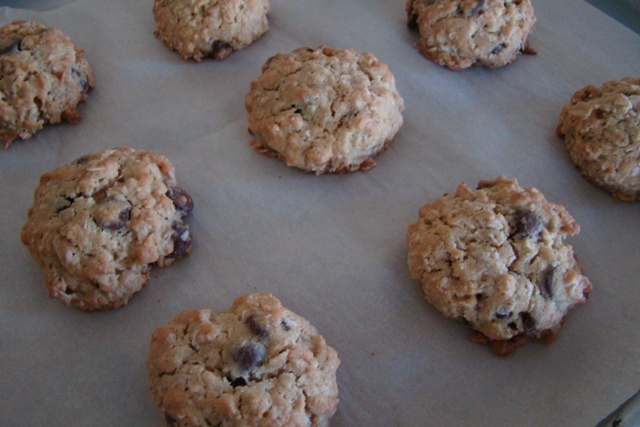 Oatmeal Chocolate Chip Pudding Cookies, adapted from Baking and Boys! Preheat oven to 375 degrees. Line two baking sheets with parchment paper. Set aside. In the bowl of an electric mixer, cream together the butter and sugars for 2-3 minutes. Scrape sides of bowl. Add the eggs and beat another 2 minutes. Mix in the instant pudding. Combine the dry ingredients in a bowl and whisk together. Add the the dry ingredients to the mixer and beat just until combined. Fold in the chocolate/mix-ins by hand. Scoop the dough into tablespoon sized balls on the baking sheets and bake for 10 minutes.